Black tiger swallowtails mimic the distasteful pipevine swallowtail. For the last few weeks mosquitoes and kudzu bugs grabbed our attention at Bug of the Week. This week we take a respite from these noxious insects and visit the delightful eastern tiger swallowtail. In recent summers past, insect lovers lamented the scarcity of butterflies around their yards and gardens. However, this summer witnessed a renaissance of magnificent butterflies. Forces of nature that underlie upswings and downturns in populations of butterflies are not fully understood, but an abundance of high quality food for caterpillars, favorable temperatures for growth of larvae and foraging of adults, and a relative absence of natural enemies benefit butterflies. Five tigers in a small patch of butterfly weed set a new record! Whatever the cause, this year has brought an uninterrupted stream of butterflies to patches of butterfly weed, vinca, and verbena in my butterfly garden. A few weeks ago we met the gorgeous spice bush swallowtail. This week we visit one of the most frequent visitors this year, the spectacular eastern tiger swallowtail so named for its dazzling pattern of alternating bands of yellow and black. Young swallowtail larvae cleverly mimic bird droppings to avoid becoming someone’s dinner. Butterflies visit flowers for nectar, a primary source of carbohydrates needed to power them through the landscape in search of mates and suitable food plants for their young. 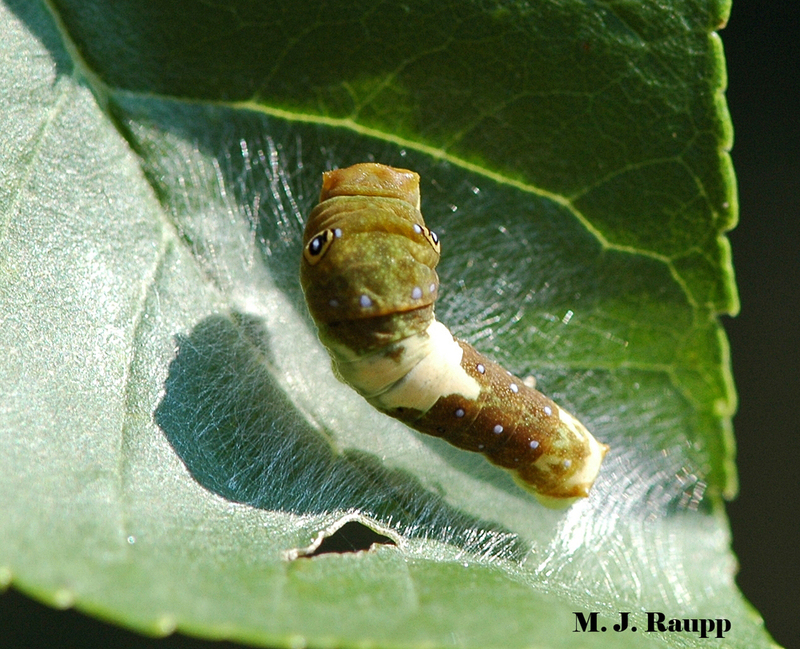 Females live only a few days in the wild and deposit small eggs on leaves of suitable larval trees including tulip poplars, cherries, ashes, magnolias, and several others. Tiger swallowtail larvae are masters of disguise. As you might imagine, plump juicy caterpillars are delicacies for a variety of birds, reptiles, and small mammals. One way to gain protection from these hungry beasties is to engage in the art of deception. The inconspicuous swallowtail eggs hatch into larvae that masquerade as bird droppings. Even hungry predators like birds are unlikely to connect bird droppings with dinner, and dressing as a bird dropping is a very clever disguise for a juicy caterpillar. Large creepy eyespots of older swallowtail caterpillars frighten would-be predators. As the swallowtail caterpillar grows larger and more apparent, a different subterfuge is used. The second trick is to be bold and look dangerous like a snake. The latter stages of the tiger swallowtail caterpillar bear two large eyespots on their back which strongly resemble those of the spice bush swallowtail we met a few weeks ago. Eyespots are not true eyes, but only patterns of colors on the skin of the insect. Look closely at these. The eyespots are remarkably complete with pupils and irises. Viewed head-on, the larva of the tiger swallowtail looks like a green viper with very large eyes. Remember, snakes and birds are mortal enemies. Snakes often capture birds for dinner. Confronted by a serpentine creature with very large, scary eyes a bird may opt to seek its dinner elsewhere. The caterpillar’s trickery allows it to live another day! This hungry Eastern swallowtail butterfly puts the "probe" in proboscis! The adult tiger swallowtail engages in a ruse of its own. Throughout much of the range of the eastern tiger swallowtail, a second species of swallowtail shares flowers and airspace. The pipevine swallowtail, Battus philenor, has a black dorsal surface that is easy to recognize. Caterpillars of the pipevine swallowtail eat plants in the pipevine family that contain repellent chemicals called aristilochic acids. Larvae store these noxious acids and pass them along to adult butterflies. This imparts a nasty flavor to the butterfly and predators learn to avoid them. In parts of its range where pipevine swallowtails are common, the clever tiger swallowtail evolved a dark color pattern that resembles the coloration of its unpalatable cousin. These mimics gain protection from predators that have learned not to tangle with darkly colored, distasteful butterflies. On a bright summer day when you see the gorgeous yellow and black tiger swallowtails in your garden, know that you are host to a true master of disguise. With proboscis aquiver, an eastern tiger searches for nectar. The delightful books and articles “Secret Weapons” by T. Eisner, M. Eisner, and M. Siegler, “Butterflies” by P.A. Opler and G.O Krizek, and “Butterfly Ecology” by L.E. Gilbert and M.C. Singer were used as references for this episode.